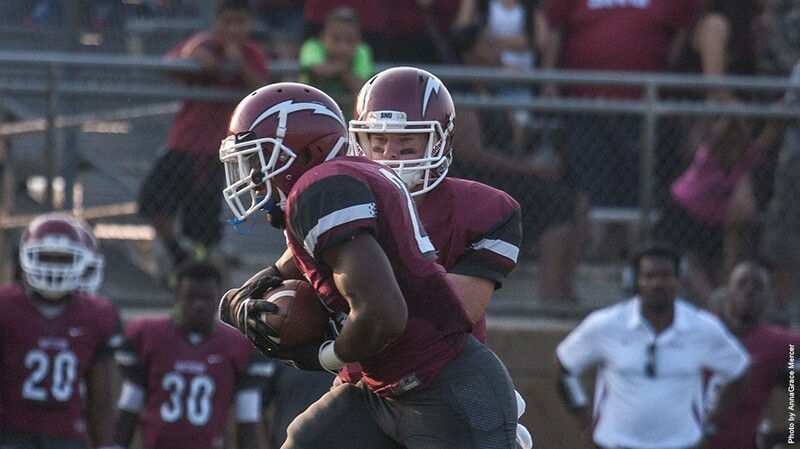 One week after dropping their season opener at Henderson State, Southern Nazarene dropped their 2013 home opener to Ouachita Baptist University by a score of 49-24. The Crimson Storm (0-2, 0-2 GAC) simply couldn’t come up with an answer to the Tigers’ balanced offensive attack, which had 480 total yards, with 262 yards rushing and 218 yards coming through the air. Southern Nazarene, on the other hand, could only muster 265 yards of total offense, with quarterback Dylan Terry throwing for 189 yards and a touchdown, while running back Chris Hunter added 91 yards and two touchdowns on the ground and Ryan Mischler added 70 yards and a receiving touchdown. Ouachita Baptist raced out to an early 14-0 lead in the first quarter thanks to rushing touchdowns on their first two possessions. The Crimson Storm would finally get on the board, thanks to a touchdown run by Hunter with just over four minutes left in the first quarter to cut the deficit in half. However, two more touchdown runs for the Tigers would increase the lead to 28-7 with less than five minutes to play in the first half. SNU would answer back, though, scoring 10 points in the last minute of the first half. Hunter would score his second touchdown of the evening with 33 seconds to go, then, following an interception by Sherrod Daniels, Shaun Barnard would deliver a field goal as time expired to make it a 28-17 game headed into the locker room. Unfortunately, the second half belonged completely to the Tigers. They would see their lead increase to 42-17 by the early stages of the fourth quarter before the Crimson Storm offense could get on the scoreboard again. This touchdown came through the air, as Terry hit a diving Mischler to bring the score to 42-24. OBU would put the final nail in the coffin with a touchdown drive with five minutes to play to lead 49-24, which would end up as the final score. On, the defensive side, Michael Hicks led the way for the Crimson Storm on defense with nine tackles, while Dylan Parker, Josh Price, and Blake Cavill each had seven tackles. Christo Lisika and Jake Garrett also combined for a sack. Southern Nazarene will play host to conference foe Arkansas Tech next weekend. The Wonder Boys (1-1, 1-1 GAC) enter this matchup coming off a loss to Southwestern Oklahoma State. Kickoff for this game is set for 6 p.m.